We have recently updated our stunning traditional bathroom range, Old London, with the addition of a beautiful new collection of classic bathroom furniture featuring magnificent polished marble vanity basins for grand bathroom looks - the perfect choice for period-style bathrooms, en-suites and cloakrooms. Overflowing with decadence and sophistication, the new floor-standing range of cabinets and coordinating accessories follows the signature Old London look centred on luxurious classic design fused with the latest innovations in bathroom technology. The striking new pieces of bathroom furniture feature framed shaker-style door fronts, tongue and groove styling to side panels, elegant curves to decorative plinths and brushed chrome knobs. The collection is also available in three heritage colours; Twilight Blue, Storm Grey and Timeless Sand, with a textured woodgrain finish. The units include soft-close doors as well as being supplied ready assembled for quality and ease of installation. 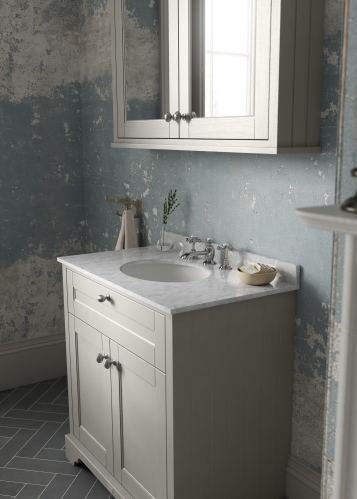 To add a touch of opulence, the choice of vanity units come with a polished marble top, in white, black or grey marble, or alternatively, in crisp white ceramic. The comprehensive selection of vanity units with basins includes both standard sized vanity units (600mm and 800mm wide), as well as the popular twin, ‘his and hers’ unit measuring in at 1200mm. There is also a cloakroom range available in 515mm, 560mm and 600mm widths, including a practical corner cabinet at 595mm x 449mm. 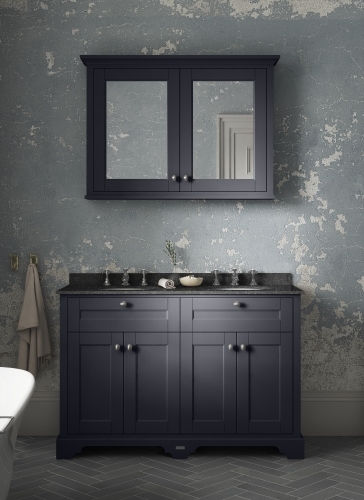 For further flexible and design-led storage solutions, the new Old London Furniture range also includes a matching mirror cabinet, mirror, tall boy unit, WC unit, bath panels and seat – all flawlessly finished for a timeless, yet stunning bathroom look. Like all bathroom furniture from Hudson Reed, the new Old London collection is manufactured to exacting quality standards, is extremely hard-wearing and comes with a five-year guarantee for extra peace of mind.